Build the perfect resume on your own using our downloadable sample and expert writing tips, or save some time by taking advantage of our custom resume builder. 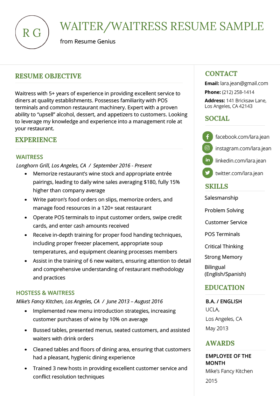 Lead Bartender with 3+ years of experience in cocktail preparation and creation, and a bartending license certified by the District of Columbia. Possess a deep knowledge of local craft beers, wine, spirits, and cocktails, as well as their optimal food pairings. Seeking to leverage my bartending skills to fulfill the Head Bartender position at your restaurant. GILLY’S SPORTS BAR – Washington, D.C.
CAPITAL BAR & GRILL – Washington, D.C.
JOHNS HIGH SCHOOL, Washington, D.C. According to the Bureau of Labor Statistics, the job outlook for bartenders over the next decade is quite promising. Between 2014-2024, the employment opportunities are expected to grow by at least 10%. When it comes to salary, it’s hard to calculate an estimate of what bartenders actually make because tips are not always accurately reported. With that being said, the average salary can fall anywhere between $45,000-$73,000. At the most lucrative places for bartenders, such as fine-dining restaurants, cocktail bars, and high-end resorts, you can certainly earn more. However, getting hired for a bartending position at one of these establishments can be fiercely competitive. That’s why it’s important to have a resume that is tailored for the bar industry. Follow our tips below to ensure that your resume has all the right ingredients. Feeling the urge to travel the world? Learn how bartending is one of the best travel jobs out there for backpackers. Although bartenders do not need to get a diploma from a bartending school, depending on their state or employer, they may need to obtain an Alcohol Server Certification. Currently, there are 30 states that regulate alcohol server training. Some of these states make server certifications mandatory, while others offer incentives – like reduced administrative penalties – for getting certified. 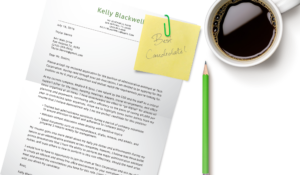 Other than your contact info, your certification is the second most important piece of information on your resume. 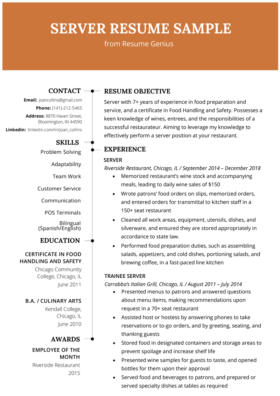 If your state or employer does require an Alcohol Server Certification, then it’s crucial that you include your certification early on in your resume. Other than your contact info, your certification is the second most important piece of information on your resume. The first thing a bar owner wants to know is whether or not you are even qualified for the job, so the first thing they will look for is your certification. Important information such as this should be included in your resume introduction. For example, the candidate in the sample resume above mentions that they possess a “license certified by the District of Columbia” in the first sentence of their career objective. Doing this helps save the employer time sifting through your resume and piques their interest in what qualities you might possess. Not sure how you should start your resume? Then learn which resume introduction is right for you. Job descriptions are useful tools when it comes to filling in your professional experience section. Many job seekers get caught up on this section because they aren’t sure what to write. They overlook the fact that job descriptions usually provide all the juicy clues they need. This bullet point is great because it not only addresses the key phrase, “Helping guests be aware of and choose menu items,” it also adds a simple, yet measurable stat to your experience (boosted spending by an average of $10 per customer). Being able to add numbers to your resume gives employers results to help them gauge your experience. 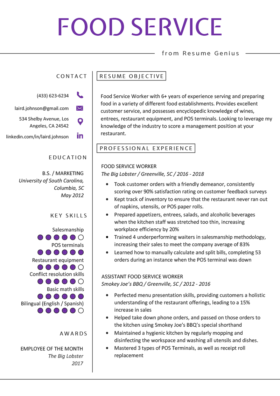 If you need tips on how to add numbers and stats to your resume, click here. Need more verbs? Check out our Action Verb Library. Follow the tips above and you will have a bartender resume that is better than 99% of the competition. If you have any specific questions on formatting or content, feel free to ask below!